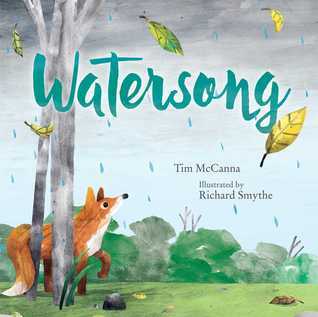 In glorious onomatopoeia, Tim McCanna takes the reader on a dazzling journey as a fox seeks shelter from a rainstorm. As the rain begins, a little fox seeks shelter. But then it builds and builds into to a torrential storm. Both a visual feast and a joy to read aloud, this stunning picture book showcases the power and beauty of nature. Wow! What a beautiful book! Not only does the text work well for a read-a-loud during story time, but the theme of the water cycle fits into the state curriculum. But my favorite part of the book is the gorgeous illustrations. It was a brilliant move on the part of the illustrator to put a fox into the mix as we follow the storm and its aftermath. I am eager to use this book with my students as we explore the water cycle. It's wonderful to have another beautiful book to share on this topic. The onomatopoeia is a great stroke as it makes for a delightful chorus for both reader and listener to share. 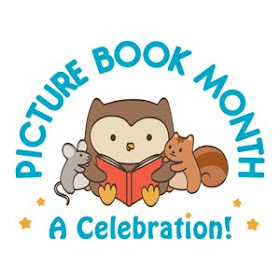 The variety of beautiful coloring in the illustrations as well as the different perspectives on the fox make this not only a fun book on an important topic, but a gorgeous work of art. During a drought in Tanzania, Grandma Elephant is in search of water for her herd. Little Calf follows along and mimics her grandmother at each stop on their journey. When Grandma leads them to a watering hole she recalls from years before, the elephants are overjoyed and Little Calf splashes about with her tender leader. Grandma's persistence and powerful memory is something Little Calf will never forget. Based on true events. Sandra Markle's acclaimed nonfiction writing takes on a more lyrical style alongside Fabricio VandenBroeck's gorgeous illustrations making this story of animal behavior accessible for younger readers. Back matter includes further information about the phenomenon of a herd of elephants that survived a drought, as well as fascinating elephant facts. Sandra Markle has written another winning book about a fascinating topic. Elephants are a topic I never tire of reading about, their intelligence and memory, the power of the bonds between mothers, daughters, and grandmothers, and the numerous ways they communicate. 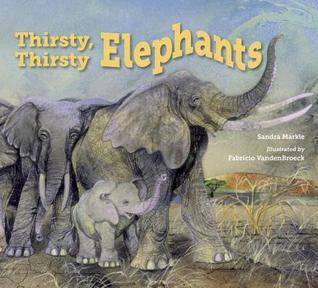 This picture book focuses on the influence of an older, experienced matriarch in helping her herd survive the drought conditions they face. And VandenBroeck's illustrations highlight the closeness of the herd and the harsh but beautiful land in which they somehow manage to survive. In addition to it's focus on the inner workings of a matriarchal elephant herd, the book also powerful presents the importance of water for all living things. Another quality work from a talented natural world voice. Rivers wind through earth, cutting down and eroding the soil for millions of years, creating a cavity in the ground 277 miles long, 18 miles wide, and more than a mile deep known as the Grand Canyon. Home to an astonishing variety of plants and animals that have lived and evolved within its walls for millennia, the Grand Canyon is much more than just a hole in the ground. Follow a father and daughter as they make their way through the cavernous wonder, discovering life both present and past. Weave in and out of time as perfectly placed die cuts show you that a fossil today was a creature much long ago, perhaps in a completely different environment. Complete with a spectacular double gatefold, an intricate map and extensive back matter. The amount of work that must have gone into this book is astounding. Each gorgeous page highlights the grandest of all canyons and the wildlife and ecosystems that call it home. The illustrations and text take the reader through both the current Grand Canyon but the layers that time has used to create it. Additional information at the back adds detail for those who are curious. But for me it's the amazing illustrations that make this book. The gorgeous four-page spread is especially awe-inspiring. 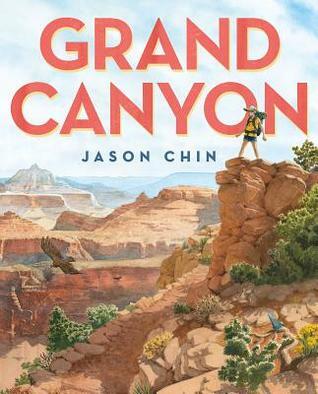 For those, like me, who have never seen the Grand Canyon in person, this book makes for an amazing recommendation for doing so. Not only is this a great introduction to the natural history of this remarkable place, but it's a stunning reminder of just how amazing the world we live in is and how much we still have to learn about it. 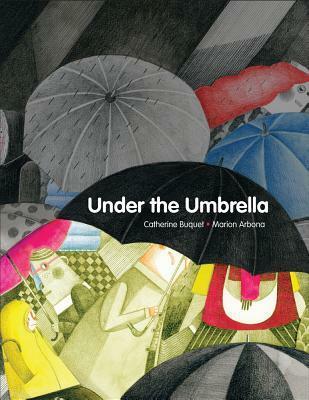 I'd definitely call this one a Caldecott contender. Ronan Truelove’s best friend, scrappy smart aleck Greta Sustermann, has no idea that she is one of the thirty-six Pure souls crucial to the safety of the world. But Ronan’s evil father has figured it out—and he’s leading the Bend Sinister straight to Greta. If they capture her, she’ll suffer a fate far worse than mere death. But to get to Greta, they’re going to have to go through Ronan first. Standing with Ronan are plucky hacker Sammy; witty, unkillable Jack Dawkins; and a sharp-tongued woman named Diz, who drives a dangerously souped-up taxi. One breathless close call after another leads to an ugly showdown: Ronan alone against his father, with the fate of Greta, his friends, and the entire world hanging in the balance. 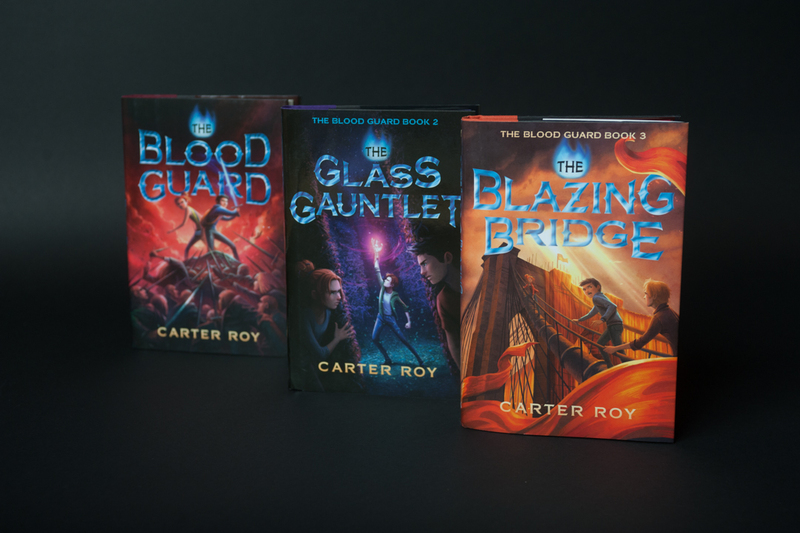 Will Ronan be able to rise up and prove once and for all that he has what it takes to join the Blood Guard? Carter Roy has painted houses and worked on construction sites, waited tables and driven delivery trucks, been a stagehand for rock bands and a videographer on a cruise ship, and worked as a line cook in a kitchen, a projectionist in a movie theater, and a rhetoric teacher at a university. He has been a reference librarian and a bookseller, edited hundreds of books for major publishers, and written award-winning short stories that have appeared in a half-dozen journals and anthologies. 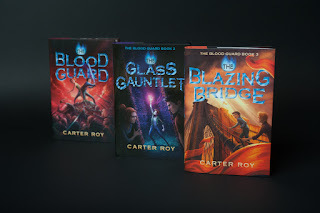 His first two books were The Blood Guard and The Glass Gauntlet. 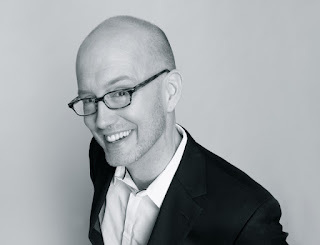 He lives with his wife and daughter in New York City and can be found at www.carterroybooks.com or on Twitter @CarterRoyBooks. And the Blood Guard Trilogy goes out with a bang! 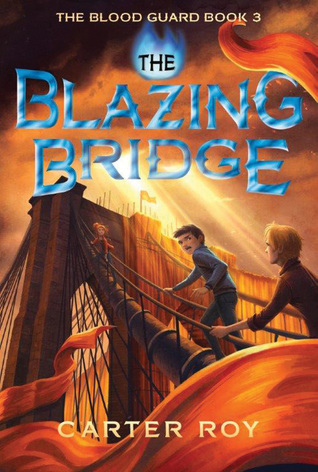 In this third book, Ronan and his friends are desperately trying to protect Greta from the machinations of Ronan's father and the rest of the Bend Sinister. But it's getting harder and harder to stop them, especially with so many of them in New York. But with the additional help of Diz, a Blood Guard cabbie, and the ongoing efforts of Dawkins and the rest of the Blood Guard, maybe, just maybe, a way can be found to stop the Bend Sinister for good. But Ronan may have to face off with his father to bring it about. One thing I've really enjoyed about this trilogy is the almost nonstop action. Ronan and his friends seem to go from one mess into another one, which of course makes these book action-packed, quick reads. They are hard to put down without finishing them. The creative touches such as Diz's souped up cab add humor to the story. And of course the numerous ways that Jack finds to injure himself make it a really good thing that he is immortal. A great finish for a fun series. Sami, a young Syrian boy, is forced to flee his town when war arrives. 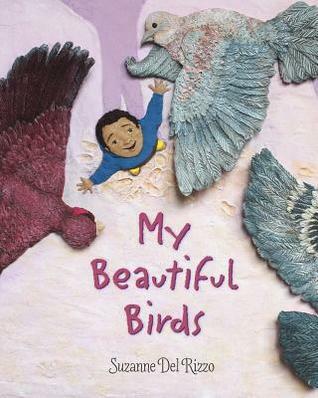 As he and his family settle in to the refugee camp, Sami can't help longing for the pigeons he left behind, his 'beautiful birds'. He can't bring himself to get involved in school or even playing games with the other children, until he discovers that beauty can be found in even the most discouraging circumstances. I think my favorite thing about this book though are the gorgeous illustrations. Using Plasticine, polymer clay, and other mixed media Del Rizzo has created illustrations that really pop out at you. The story itself really touched my heart, especially with everything going on right now. I mean, here we have a young boy who has lost his home, his pets, pretty much his whole world, and he grieves the loss, but when new birds fly into his life, he finds a reason to rejoice despite his humble circumstances. Wolves have long held a place in the American West as a villain. For ranchers and farmers, wolves threatened their livestock. Because of that they disappeared due to habitat loss and over-hunting. It was only after they were gone that people began to realize their importance to the ecosystems in which they lived. Due to the hard work and dedication of various scientists and organizations, wolves have returned to Yellowstone National Park. Godkin documents the changes that have come about because of that act. She focuses on the environmental changes that the wolves presence have brought about, including healthy and smaller herds of elk which has lead to an increase in trees and berries, which has lead to an increase in other wildlife including beavers and the cycle goes on. 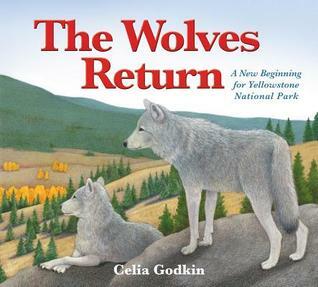 My favorite aspect of the book though are the beautiful illustrations that give the reader a peek into the natural world of the wolf. The additional information and photographs at the end of the book are certainly a great boon for teachers and other users who want to know more about the topic. A man walks through town feeling incredibly grumpy. The dark sky and flowing rain don't help his mood any. At the same time, a young boy ignores the weather to gaze with yearning at a window full of delicious looking baked goods. When the man encounters the boy, his outlook starts to change. And when they share a yummy treat under the umbrella, they discover that the weather hardly seems to matter at all. I loved the message of this book, that what we bring to the world is more important than what the world brings to us. While the illustrative style isn't particularly appealing to me, I did appreciate the use of color and shape to convey the mood of the characters and the story. The story begins with mostly sharp angles and dark colors until the boy is introduced when light, bright, cheerful colors reign supreme. The contrast between the man's mood and the boy's shows brightest in the contrasting light and dark shades. And the way the light spreads into the dark demonstrates the message of the story far beyond the ability of the text to do so. Being the new kid at school is tough, especially when your school is called Ducard Academy and your name is Bruce Wayne. There's a gang of jokers roaming the halls, a muscle-headed kid named Bane wants to beat you up, and your guidance counselor Hugo Strange seems really, well, strange. 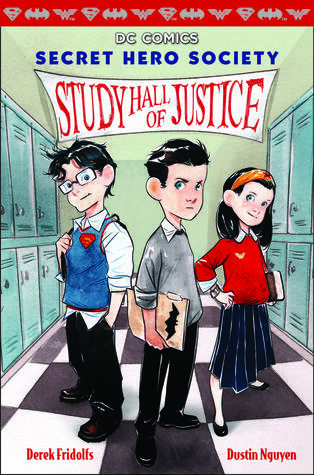 This inventive novel follows young Bruce Wayne and his friends Clark (Superman) and Diana (Wonder Woman) as they start a Junior Detective Agency to investigate their teachers and find out what's going on behind closed doors at Ducard Academy, all before recess. This all-new story presents a twist on the idea of junior sleuths, using comics, journal entries, and doodles to reimagine Batman, Superman, and Wonder Woman as three students in the same school. They'll try their best to solve their case, but just because you're faster than a speeding bullet or more powerful than a locomotive, it doesn't mean you get to stay up past eleven. With the incredible ongoing popularity of superheroes, a series like this one is bound to be popular. 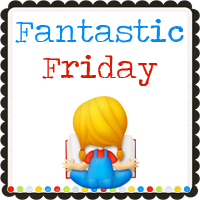 I myself enjoyed reading about the antics of a young Bruce Wayne and his newly found friends, Clark Kent, and Diana Prince. As a graphic novel, the book makes for a pretty quick read. Bruce Wayne tells his story through instant messages, diary entries, school reports, broken up with graphic novel panels. Bruce, Clark, and Diana are investigating the strange happenings at their new school, but they have to do it without revealing all their own secrets. For young superhero fans who aren't ready for the confusing world of comics with their numerous different story lines, this book makes for a great precurser. Clark Kent is thrilled when he receives an invite to a spring break academic retreat. After taking down the villains of Ducard Academy the previous year, going back to life on the farm was a bit dull. Better yet, his friends Bruce and Diana have been invited there, too! What better way to spend spring break than with old friends (Poison Ivy, Harley Quinn) and new ones like Arthur Curry (Aquaman), Barry Allen (the Flash), and Vic Stone (Cyborg)? When Clark arrives at Camp Evergreen he makes new friends, reconnects with old ones, and nothing seems weird at all! Well, that is until kids start disappearing... One by one... Plus, there's a lake monster, bigfoot has been spotted, there are reports of a boogeyman, and there may or may not be a UFO crashed into the lake. Clark, Bruce, and Diana will have to re-assemble the Junior Detective - er- Criminal Investigation Unit, in an all-new, supernatural adventure! 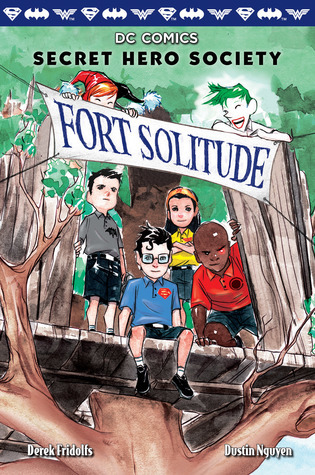 In this second book of the Secret Hero Society series, Clark Kent meets up with his friends Diana Prince (Wonder Woman) and Bruce Wayne (Batman) at summer camp. Through the use of journal entries, camp schedules, and comic panels, Clark tells the story of his adventures at a rather unusual summer camp. Naturally he and his pals have to investigate to figure out why so many kids are disappearing. It's kind of fun to see all the different superheros and villains before they've completed their transformations. While the book is all black and white, the pages are broken up by the variety of different illustrations, which I particularly enjoy. This is a fun series for young readers who are obsessed with the superhero world but who aren't ready for the older fare. I wasn't a real fan of this book at first. The story just didn't appeal to me much. 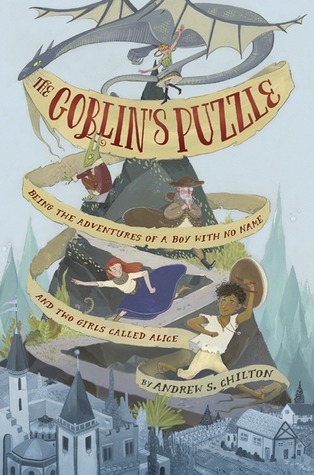 But as I got further into the story, especially the part where the boy meets the goblin, I become more interested. And as the characters and their various problems started coming together I became curious as to how things would work out. I found the boy an especially interesting character with his solid belief in the stories he'd heard his whole life and his supposed acceptance of fate. I was intrigued watching the boy change in his beliefs and desires as he started making choices for himself, as he learned what freedom felt like. And the two Alices were such an interesting contrast to each other. After reading what the king thought of his daughter (Princess Alice), I kind of had an idea of what she would be like, and she was to some degree (as she had been taught to be), but she surprised me to. And Plain Alice (soon to become Just Alice) was as amusing as she was bossy. As for the goblin and his 'puzzle', he was the enigma throughout the whole book. It was hard to guess just what the goblin's motives were, and even at the end it wasn't altogether clear, although I have my own inferences about what happens. I can safely say that this is quite an unusual book, especially the logic puzzles part of it. 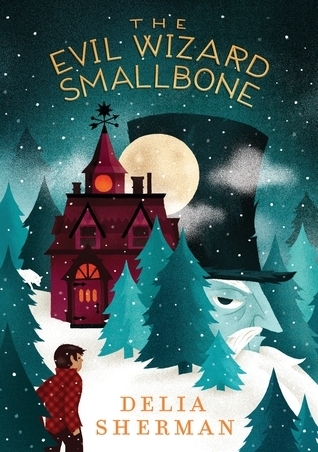 In a hilarious tale reminiscent of T. H. White, a lost boy finds himself an unlikely apprentice to the very old, vaguely evil, mostly just grumpy Wizard Smallbone. When twelve-year-old Nick runs away from his uncle’s in the middle of a blizzard, he stumbles onto a very opinionated bookstore. He also meets its guardian, the self-proclaimed Evil Wizard Smallbone, who calls Nick his apprentice and won’t let him leave, but won’t teach him magic, either. It’s a good thing the bookstore takes Nick’s magical education in hand, because Smallbone’s nemesis—the Evil Wizard Fidelou—and his pack of shape-shifting bikers are howling at the borders. Smallbone might call himself evil, but compared to Fidelou, he’s practically a puppy. And he can’t handle Fidelou alone. Wildly funny and cozily heartfelt, Delia Sherman’s latest is an eccentric fantasy adventure featuring dueling wizards, enchanted animals, and one stray boy with a surprising knack for magic. After running away for the third time, Nick stumbles onto the dwelling of the Evil Wizard Smallbone who forces him to become his apprentice. But he doesn't teach Nick any magic. But Nick, being a rather resourceful kid, discovers that the bookstore that Smallbone supposedly runs will help him learn magic, but only if he cooperates. Meanwhile, the Evil Wizard Fidelou is working on bringing down the magical Sentries (spells) that are keeping Smallbone Cove protected, and Nick's cousin and uncle are helping him. After some rather interesting twists and turns, Nick and Smallbone must face off with Fidelou because not only their own lives, but the lives of everyone in the Cove depend on it. I can't say that I found this particularly funny. And I didn't find the characters particularly appealing. But the plot did hold my attention with it's interesting twists and turns. I loved the idea of the bookstore being a living entity and the books that talked to Nick. And the plotline involving the animals was definitely a nice touch. While this was definitely not my favorite among the seven Cybils finalists that I read, I did enjoy it and could see why it ended up on the list. I can safely say that I've never read another fantasy quite like it. Grace Lin has done it again. She's created a fabulous fantasy story about finding one's voice and courage. But she's done it while integrating the main story with a bunch of shorter, folktales that twist and turn until somehow they all come together with the main plot at the end. Pinmei and her grandmother, the storyteller, live together on the side of a mountain. 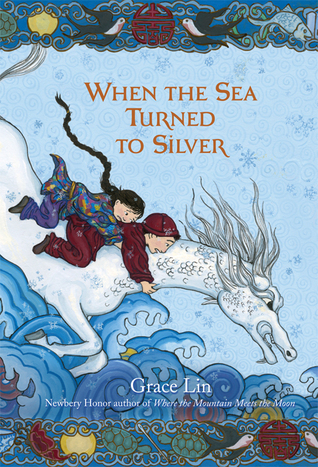 When the greedy Emperor comes and takes grandmother away, Pinmei, along with her friend, Yishan, set out to find and rescue her. But in order to get her back, the two children must find a Luminous Stone. While on this quest, the two children run into other people and characters who help and sometimes hinder their efforts. I think my favorite thing about this book though are the gorgeous, beautifully colored illustrated scattered throughout the book. The book is full of interesting plot-twists and surprises that make the end of the book all the more satisfying. Twelve-year-old Brine Seaborne is a girl with a past--if only she could remember what it is. Found alone in a rowboat as a child, clutching a shard of the rare starshell needed for spell-casting, she's spent the past years keeping house for an irritable magician and his obnoxious apprentice, Peter. When Brine and Peter get themselves into a load of trouble and flee, they blunder into the path of the legendary pirate ship the Onion. 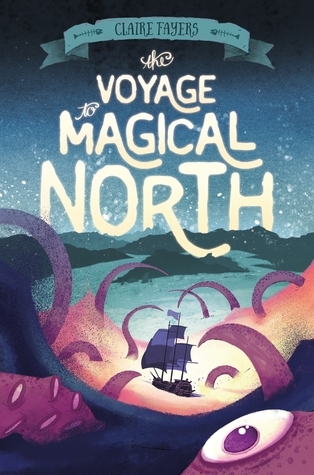 Before you can say "pieces of eight," they're up to their necks in the pirates' quest to find Magical North, a place so shrouded in secrets and myth that most people don't even think it exists. If Brine is lucky, she may find out who her parents are. And if she's unlucky, everyone on the ship will be eaten by sea monsters. It could really go either way. I quite thoroughly enjoyed this story about spirited Brine and her reluctant companion, Peter. It was fun seeing both main characters grow and change as they experienced new things especially Brine as she started to develop her talents. It was an interesting twist that she couldn't do magic and Peter could and yet she gets along better with the pirates than Peter does. Yet that very scenario causes Peter to turn to the villain, however reluctantly for support, even though he knows he shouldn't. I also found the world building to be well-done with the starshell magical source that nobody seemed to understand yet which plays a key role in the story, especially the surprising twists at the end. I found the story line to be refreshing and different which is saying something what with the plethora of fantasy tropes now in existence. And I appreciated the fact that even the villain didn't seem so completely black all through the story (mostly though), and the pirates are definitely more shades of gray. Favers has created a thoroughly enjoyable fantasy with great characters, a creative, unique world, and an interesting story line. Twin brother and sister Benji and Kelly wander off at the local county fair after witnessing their parents argue. When Benji runs into a group of bullies, he escapes into a tent called The Memory Emporium, where he meets a strange old man inside named Louis. The old man shows him a magically vivid memory of a fighter pilot, in the hopes of getting Benji to pay to see other memories Louis has collected from people over the years. 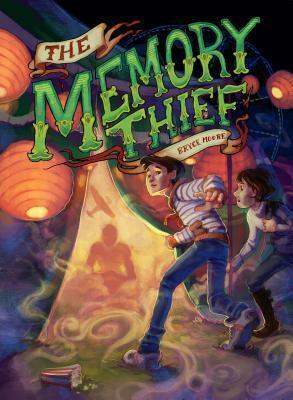 Benji quickly realizes the ability to take memories could help his parents stop fighting with each other, and he asks Louis to teach him how to become a memory thief. But Louis isn't the only person with the ability to show and manipulate memories. There's also the mysterious Genevieve, a Memory Thief with much more nefarious motives. Benji learns how to manipulate memories himself, but having that power comes at a cost to his family, and possibly to his own mind as well. Genevieve's powers get out of control as she steals more and more memories from people in town including Benji's sister, Kelly. Benji must learn to use this newfound power, as he is the only one able to stop Genevieve. I've read a lot of fantasy novels for middle grade readers over the years. It's a genre that I particularly love. And I can say that this particular novel is different than any I've read before. Benji is really frustrated with his parents, who fight all the time and are even planning a divorce. At the county fair, Benji runs into an old man who claims to be a Memory thief, he buys and sells memories. After discovering that his parents are getting a divorce, Benji is interested in the old man's services, hoping that taking away his parents' angry memories might 'fix' the problem. But Benji and his twin sister, Kelly run into Genevieve instead. When Genevieve steals some of Kelly's memories without her permission, Benji all of sudden has bigger problems than his parents fighting. Benji seeks out the old man only to be given a significant portion of the old man's memories. Know he knows who to steal memories himself, but he doesn't have the experience that Genevieve has, but he is all too aware that he's the only one that has any chance of stopping her from robbing the entire town of valuable memories and repairing his own mistakes. Not only does this fabulous story provide a fascinating and exciting plot, but there is a powerful theme here of the morality of 'fixing' things by taking things that don't belong to you. This makes for a great read for young fantasy lovers who are ready for something a bit different. 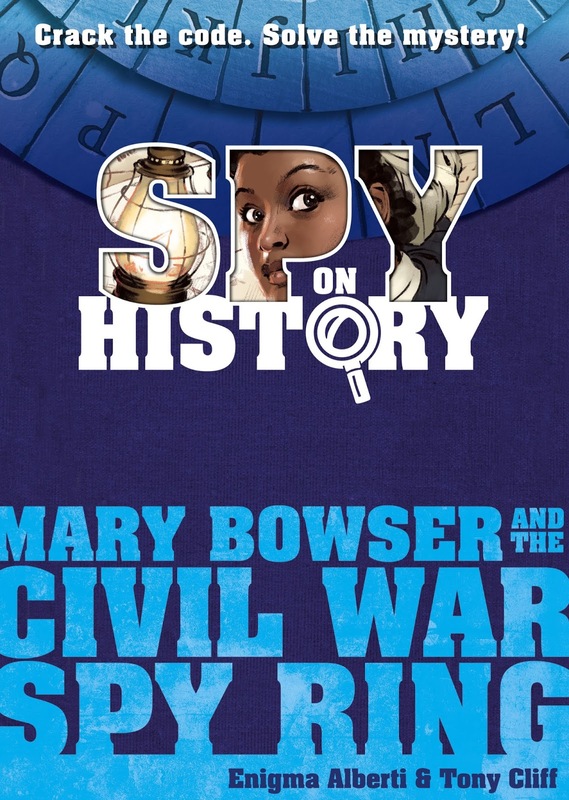 Mary Bowser and the Civil War Spy Ring introduces an exciting interactive series for middle grade readers—Spy on History, where the reader gets to experience history in a whole new way. 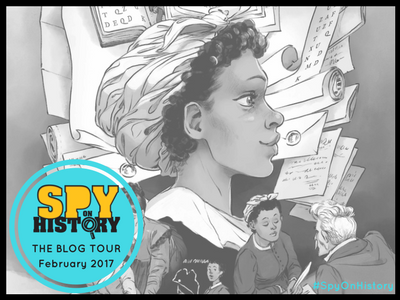 Meet Mary Bowser, an African American spy who was able to infiltrate the Confederate leadership at the highest level. Enigma Alberti dramatizes Mary Bowser’s suspenseful story—how she pretended to be illiterate, how she masterfully evaded detection, how she used her photographic memory to “copy” critical documents. Using spycraft materials included in a sealed envelope inside the book, a canny reader will be able to discover and unravel clues embedded in the text and illustrations, and solve the book’s ultimate mystery: Where did Mary hide her secret diary? Illustrator: Tony Cliff is the author and artist behind the New York Times bestselling Delilah Dirk graphic novel series. Find more on Tony at www.tonycliff.com and @TangoCharlie on Twitter. I'm excited about this new Spy on History series. I not only enjoyed reading the story of Mary Bowser, but the interactive element is fabulous as well. As the reader digs into the adventures of Mary Bowser as she spies on the Confederate President Jefferson Davis during the Civil War, the book is full of clues and codes for the reader to try to figure out. Materials are even included to help the reader figure things out. And this isn't an easy task. I'm eager to go back and give the clues my full attention now that I've finished reading the book. The answers are included in a sealed section at the back of the book. I am especially appreciative of the fact that this book looks at the efforts of an African American woman whose work was not fully appreciated at the time. I'm eager to read the adventures of the other people highlighted in this developing series. This book may not work well in a library because of the interactive elements but it would make a great gift for young mystery/spy enthusiasts. 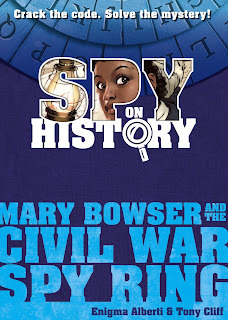 Because so little is known about Mary Bowser the book is of necessity, historical fiction. The author's note at the end explains what information is accurate and what had to be surmised. QUESTION: If you could go back to anytime or place in history, where would you put your spy skills to use? Where would I go to put my spy skills to use? Hmm. That's a very good question. I have a sneaking suspicion that I probably wouldn't make a very good spy. My poker face is negligible. However, if I were to pick a time and a place, I would probably go to the Cold War era. I'm not sure I could handle the living conditions farther back in time. Although I'm sure I'd adjust if there wasn't any other choice.